Tangerine refers to an orange colored citrus fruit; it is smaller than a regular orange. It is said to belong to the Mandarin family. Tangerine gets its name from the Moroccan port Tangier, from where it is believed the first batch of tangerines were shipped to Europe in the year 1841. Although it is native to China, currently it is the U.S. which is the largest producer of Tangerine and Tangerine oil. Tangerine oil is obtained by cold pressing the peels of the fruit. There are fresh, slightly sweet and citrus notes to the fragrance. This essential oil is believed to promote happiness and relieve anxiety. Spasms can have a highly damaging impact as they may not be restricted to muscular spasms alone but can occur in other parts of the body like the respiratory system, digestive and nervous system. Tangerine oil, with its relaxant properties, induces the same effect on the above mentioned organ systems, thus helps control spasms. Tangerine oil is widely used in aromatherapy as it helps calm, relax and soothe agitated nerves. It is also a sedative and greatly relieves conditions like depression, anxiety, stress, panic attacks, etc. As the body enters a state of relaxation the mind gets time to recuperate from the pressures of stress, lifting the spirits and obtaining an overall sense of well being and security. Tangerine oil helps fight bacteria that may enter the body through open cuts and wounds and cause a septic infection. This essential oil prevents the infection from spreading and thus preventing the body from experiencing any pain or discomfort. It also assists with a speedy recovery. 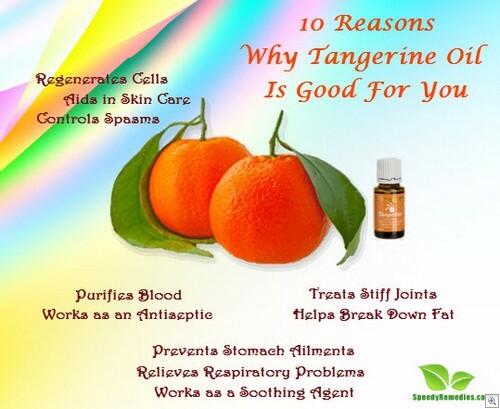 Tangerine oil can be applied externally to the wounds or ingested for a uniform affect on the entire body. Tangerine oil helps restore the whole body by boosting cell division and regeneration. It ensures that cells and tissues that are damaged are replaced and repaired. This facilitates the healing of the wear and tear of the body as well as promoting general growth. Tangerine oil is what is known as a ‘depurative’ – an agent that purifies blood. It increases the oxygen retaining capacity of the red blood cells along with helping the body get rid of the unwanted toxins and other waste substances that collect over time. Toxins are released from the body via sweating, urination, etc. ; the oil helps remove uric acid, excess salt and other harmful stuff, thereby improving the immune system, too. An unhealthy stomach affects the entire functioning of a person; if the stomach is disturbed nothing comes into perspective until the problem is fixed. This essential oil provides for healthy functioning of the stomach. It helps maintain the proper flow of juices and digestive fluids to the stomach. It keeps a check on the balance between acid and bile, heals wounds and reduces inflammation if any and soothes the stomach. Tangerine oil takes care of the entire functioning of this organ and ensures that the digestive system is free from any discomfort. When used as massage oil, tangerine oil helps break down fat pockets and cellulite. As it also helps detoxify the body, consuming the oil orally helps boost the metabolism as well. Tangerine oil is said to provide relief from stiff joints and joint pain. When massaged on the affected area it relaxes and soothes the muscles and nerves, thereby assisting in the treatment of stiff and painful joints. Respiratory problems like asthma, breathlessness, etc can be cured using tangerine oil in a vaporizer, burner or diffuser. It calms the nervous system and thereby, aids in relieving breathing problems, as stress is known to aggravate these conditions. Tangerine oil is known for its antiseptic properties as mentioned earlier, and hence prevents various forms of skin disease. Alongside it is useful for dealing with oily skin, acne and pimples. It can also be a cure for rashes and dryness of the skin. Use of this oil may lighten stretch marks as well. Moreover, tangerine oil works as a hair tonic. Thus, it can be used to treat hair and scalp problems, especially dandruff. There are a few things that should be kept in mind when using tangerine oil. For instance, it may cause skin irritation in some people when applied topically. Furthermore, pregnant women should consult their doctors before using tangerine oil. Lastly, this essential oil is said to be photo-toxic, meaning that one should avoid going into direct sunlight in order to avoid exposure to UV rays for 72 hours after having applied this oil to your skin.